I can only apologise for the hiatus – to cut a long story short, it’s down to depression. But no need to discuss it any further. Let’s move on. Oh right, we can’t. Because Everton are suffering an existential crisis. The final string tying us to that victorious plateau has snapped and now we’re free-falling, trying to convince ourselves our existence means more than simply staving off the dark clutches of relegation. But we can’t. Where do we go now, said Guns ‘N Roses. Where do we go? From now til May, the answer is nowhere. We’re rooted firmly in the grey zone, people. Simply put, Thursday night was a fitting shambles – fitting in that it sums up the vast majority of our season perfectly. If you’re going to go out of Europe, why not in a blaze of pathetic defending against some half-wits cowering in the shadow of the Russian behemoth? The whole thing was enough to plaster millions of heads in hands for so long that those who managed even to slightly wrestle their despairing digits from their eyes were walking around for days looking like Edvard Munch’s The Scream. Which is exactly what we were doing. The ninety minute procession that saw the Everton coffin dropped into the ground rather than carefully lowered was a shock more than anything given how calm the opening twenty minutes had seemed. Then Yarmolenko scored and it all kicked off. In fairness, it was a beauty, an absolute explosion of pure skill. Lukaku’s equaliser was some of the same. Parity, then, and still an aggregate advantage. Time to shut up shop, at least for a while….right? And that’s where it all went south. The three goals that killed us – Teodorczyk, Miguel Veloso and Gusev acting as the harbingers of our doom – were all horribly preventable. It would be easy to simply point at the hapless Antolin Alcaraz and blame him for the goals but the truth is the defence as a whole gave Kiev’s attackers too much space where we couldn’t afford to let them have any. Not that I’m defending Alcaraz mind – he had an absolute Kroldrup. Actually, that might be harsh on Per, who was often too busy being injured to be pure sh*te. Yarmolenko and Antunes scored fantastic goals but again they were given the space to do so. In an attacking sense we weren’t too bad. We scored two goals at the Olympic Stadium in Kiev, which should’ve been enough to see us through. Phil Jagielka has had a minor revolution as captain and even pitched in with a goal but on Thursday he skippered the Charge of the Light Brigade. There’s very little good that can be found in the wreckage of that massacre. So where do we go now? The season means little now in that it is now impossible to win a trophy and it is highly unlikely that we’ll be qualifying for Europe. So we’re drifting aimlessly towards May with lamenting saxophone music blaring and all our regrets swirling about our heads. But it means a hell of a lot for Roberto Martinez and his players, because they’re playing for their jobs. Roberto Martinez delivered one delirious, magical season, and now he has delivered this horror show. Logic would suggest that he should be given a third season to show which showing was a flash in the pan and which one actually reflects his quality. But we can’t afford a repeat of this season. Roberto Martinez is on a dangerous downward trajectory and as it stands he’s heading straight for the sack. Only he can change that. A number of the players are playing for their future – some who want to playing at the very highest level need to prove they belong there, while some need to prove that they shouldn’t be jettisoned. It’s clear an overhaul is needed and not everyone will survive it. But perhaps we’re looking too far ahead, because we still have a number of hurdles to leap. QPR. Southampton. Swansea. Burnley. Man Utd. Aston Villa. Sunderland. West Ham. Spurs. Last season we would’ve looked at those final nine fixtures and lick our lips in anticipation of a serious points haul. This time we’re just looking to pick points up where we can. And QPR is the ideal opponent in that sense. QPR are the worst team in the league. Simple. They have better players than Leicester, who sit below them, and Burnley, who sit above. But as a team they’re practically non-existent. The legions of overpaid, highly strung mercenaries who encapsulate the superficial side of football outsiders point and sneer at can’t even peek above the parapet of the relegation zone. Even Harry Redknapp, him with a face like a bemused Doberman, like an old loincloth, like an over-broiled pork chop, couldn’t use his supposed magic to make them look like a team before he resigned. Now Chris Ramsey has to be the poster boy for a dismal relegation, like the likes of Terry Connor, Alan Shearer and Colin Todd amongst others have done before. In goal will be unsung hero Robert Green, who deserves his England call-up simply for holding back what has mostly been an unstoppable tide. At the back, Onuoha, Caulker, Hill and Yun, although Isla may be back. Phillips, Kranjcar, Sandro and Barton in the midfield. Yes, Joey Barton. Booooooooo Joey Barton. Taarabt and the actually possibly dangerous Charlie Austin up top. We could see the likes of Vargas, Wright-Phillips, Hoilett and Zamora too. And if that doesn’t sum up what QPR are all about, I don’t know what does. 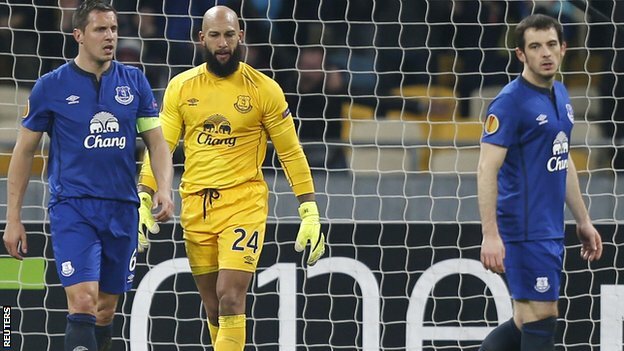 So for Everton, it’s Howard in goal again. Sigh. Coleman, Jagielka, STONES, PLEASE STONES, I’M BEGGING YOU, and Baines at the back. McCarthy with Gibson and Barkley, perhaps. Maybe Osman. Kone and Lennon could flank Lukaku as they did successfully against Newcastle, or Steven Naismith could be there in his mini-crisis. Kevin Mirallas is…somewhere. The whole team is…somewhere. So, are you ready for a big apology Blues? I’m sorry I went away but I’m back now and ready to return to my best. It’ll come. We need to hear the same from Everton now. Although a comfortable 3-0 win will speak louder than words. Come on then Everton, give us our hope back.